The Yankees should trade Melky Cabrera for the same reason they called up Brett Gardner today: there are better options out there. That’s not to say that Melky isn’t any good. He covers Yankee Stadium’s spacious centerfield well and his arm is the best they’ve had in center in many a season. That said, it is becoming clear that his bat is not going to develop the way the Yankees had hoped and most likely won’t be much more than a no. 8 hitter in the Yankee line-up. His hitting against lefties has gotten progressively worse (.198 BA against lefties this year). He’s always had trouble against power pitchers (lifetime .245 BAA) as well as finesse pitchers (lifetime .241 BAA), but has done well against junkballers. Overall, Melky is the kind of hitter who may do well against back-of-the-rotation types, but can’t handle a good pitcher. Melky is adequate. Adequate won’t cut it in Yankeeland. Especially not when there are other options. And there are. While Melky’s OBP is .312 and falling and his slugging is a sad .354, AAA prospect Brett Gardner in Scranton, has an OBP of .412 and a slugging percentage of .429. He also has 34 stolen bases and an astonishing 10 triples!! 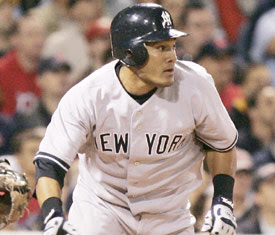 Also, in 2006 Baseball America rated Gardner the best defensive outfielder in the Yankee system. Gardner, 24, could over time develop into a leadoff-pest type of run-producer who can take the extra base, be a threat to steal, an d be a constant worry for opposing pitchers and catchers. And Lord knows his speed would be a jolt to the Yankees poky, station-to-station base-running roster. Currently, the Yankees have 48 stolen bases. To whit, the Devil Rays have 88, the Red Sox 74. OK, so who can the Yankees get for Melky? Well, sure I’d love to shoot pie-in-the-sky and go for names like Eric Bedard or Ben Sheets, but the guy who the Yankees could realistically trade for and get great value for in return is a lesser-known name: Damaso Marte. A lefty reliever for the Pirates, Marte is exactly what the Yankees need; that is, a bullpen lefty who can get opposing lefties out. Marte has a dominating lifetime .198 BAA against lefty batters, something the Yankees will surely crave come the next time Big Papi is up with two on. Also, unlike a lot of National League pitchers who fold once they get to the American League, Marte has pitched in the AL before, and has pitched well. For four years, he threw for the Chicago White Sox and the highest his ERA got was 3.77. 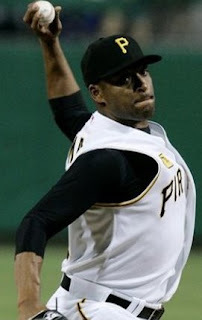 To the Yankees, Marte would be the unicorn standing next to a four-leaf clover at the end of a rainbow, an experienced lefty out of the pen come October. It probably will take more than just Melky to get Marte. The Yanks might have to take Adam Laroche off the Pirates hands as part of a Pirates salary dump: LaRoche is making 5 million while batting a soggy .221. Eating LaRoche’s contract for the rest of this year for the Pirates and giving them a low- to mid-level prospect is a win-win deal for the Yankees and the Pirates. The Pirates farm system was rated a truly pathetic 26th out of 30—especially considering how often they’ve drafted high in the Amateur draft—and could use a prospect from the 5th-rated Yankees farm system. Not to say the Yankees should hand over a great prospect to the Pirates—Mitch Hilligoss should do it. If that doesn’t do it, the Yanks could redouble their efforts for the more-heralded Brian Fuentes. Fuentes, also a lefty and 32 as well, is pitching an impressive 2.56 ERA and lefties are hitting .174 against him. However, more teams are interested in Fuentes and the price for him might be higher—Jose Tabata or Mark Melancon might be demanded, a price the Yankees should not pay. Also, in an interesting stat, while Marte has a 2.45 ERA in late-inning pressure situations with RISP, Fuentes has a 4.85 ERA. And Marte did pitch 1.1 scoreless innings against the Yankees last week. Some might say this trade is too costly for the Yankees. After all, Melky is just 23, is a good defensive outfielder, and is a streaky hitter who can get hot—in fact, it was about this time last year when he got hot. But the truth is, is that the league has caught on to Melky, and he is unable to adjust. Conversly, the league now has adjusted to Melky's weaknesses and are exploiting them. Last night’s game is a perfect example: In the ninth, Melky was up with the Yanks down one and one runner on. On the mound for the Rangers was hard-throwing lefty, C. J. Wilson. Hard-throwing and lefty—signing point to Melky having a problem with this. The result, Melky grounded softly into a double-play. I like Melky, but the Yankees should trade him for 2 reasons; Marte can help a weak situation become strong—the pen would be immeasurably better with him as the Yanks try for the playoffs. And 2; because, there are other options in CF. Better ones.